Major works to repair leaks in the glass roof and refresh the interiors of the Oxford University Museum of Natural History have been successfully concluded by regional construction company Beard and architects Purcell. 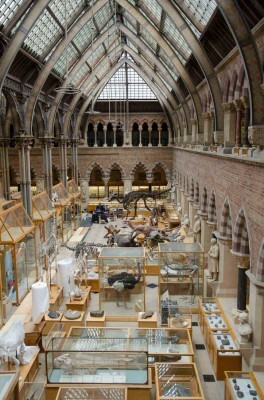 The museum houses the University of Oxford’s scientific collections of zoological, entomological and geological specimens. The Grade I-listed building has been a landmark tourist attraction and centre of learning ever since it first opened in 1860. It is also renowned as the location of the famous Huxley-Wilberforce debate on Darwin’s then recently published theories of evolution by natural selection. The Gothic Revival museum was designed by architects Thomas Newenham Deane and Benjamin Woodward. The building is characterised by its three dramatic glass and cast iron roofs, four storeys high, which span the main exhibition quad. Over the past 36 months, the museum has undergone an extensive restoration project to clean and repair its vaulted glass roof and refresh its interiors. The works necessitated that each of the roof’s 8,500 diamond-shaped glass panels was painstakingly removed, cleaned and resealed. The museum’s vaulted glass roof has leaked ever since it was completed 150 years ago, despite numerous attempts to fix it. The problem was the inconsistent thickness of the sand-cast glass tiles, which were cast to a nominal thickness of 10mm, but actually ranged from 8-12mm. These were nailed to the timber batons in an overlapping design, which created gaps that water could easily penetrate; the overlapping also meant condensation formed beneath each tile. Tests were carried out over six years to ensure that a lasting solution was found before work on the delicate structure commenced. An effective solution was devised using a mastic silicone adhesive which is both elastomeric and hydrophobic. This proved ideal for both adhering and accommodating the tolerance required for the rough surface texture of the sand-cast glass. Located under the glass, the silicon had the added bonus of prolonged life from weathering and ultraviolet light degradation. The adhesive was applied in two applications inset from the edges of each tile, bonding them together, with an overlap and a gap at the bottom to allow the building to breathe and allow any internal condensation to escape. This innovative solution is fully reversible and allows the glass tiles to move and the building to breathe while maintaining the original aesthetic. 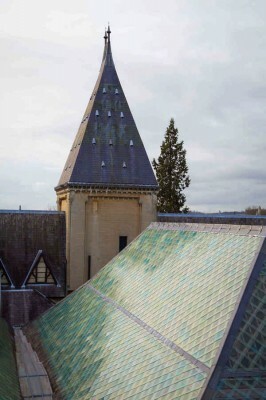 Over the years, broken tiles were replaced by an assortment of glass types including Georgian wired glass and stippolyte glazing. The unsightly glass infills, along with any irreparable tiles, have been replaced with new slumping kiln glass, or ‘textured glass’, to match their Victorian counterparts. 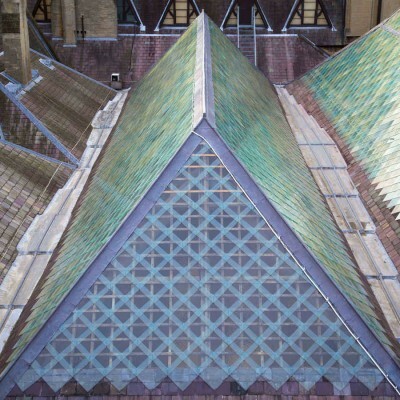 In addition, the lead has been replaced on the ridge and hips of the three glass roofs and the slate roof has also been re-laid around the roof’s perimeter, extending down to the adjoining Pitt Rivers Museum. 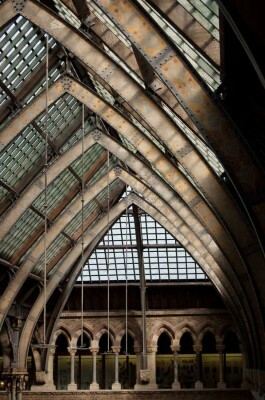 As well as the roof work, the museum interiors required extensive professional cleaning and conservation. Eura Conservation oversaw the cleaning of the glass, the decorated paintwork of the wrought iron and timber rafters, and the laser cleaning of the stone columns. Discrete light fittings have been installed to the columns and feature lights have been suspended from the former gas lamps by lighting specialists Monard to a design by Zumtobel. During the works, graffiti was discovered on the timber beams of the roof, thought to have been daubed by the Victorian roof painters. As a gesture to this, the present day project team was honoured with a plaque in the roof. While the work was carried out, parts of the museum had to remain open and some of the larger exhibits which could not be removed, notably the casts and skeletons of dinosaurs, were protected and left in situ. Many of the specimens have been newly conserved and re-displayed, including the whale skeletons which are suspended from the roof. The museum officially reopens to the public on Saturday 15th February.